Yes, it’s that time. Weddings are in the air like a fresh, spring breeze. Chances are you’ve either received an invitation, know a couple that’s in wedding planning mode, or perhaps you’re planning your own special day? A city as spectacular as Vancouver offers an endless number of indoor and outdoor settings. 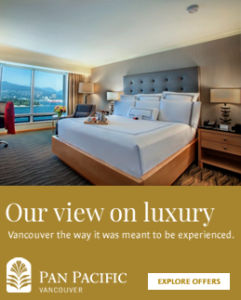 For the perfect combination of both, think Pan Pacific Vancouver. From its landmark white sails and panoramic waterfront views, to stunning indoor/outdoor event space and 5-star service, Pan Pacific Vancouver is as unmatched as it is breathtaking. Pool Terrace – ideal for a picture-perfect, outdoor ceremony, with panoramic, unobstructed views of Stanley Park and the North Shore mountains. Cypress Suite – exclusive, yet warm and intimate, this distinctive space showcases 180-degree views of the North Shore Mountains, Coal Harbour, Stanley Park and Lions Gate Bridge. Oceanview Suites – choose from 8 beautifully appointed event suites offering a range of sweeping views, including Stanley Park, Coal Harbour, North Shore Mountains, and downtown Vancouver. Crystal Pavilion Ballroom – classic and glamorous, our Crystal Pavilion offers a multi-functional setting complete with a canopy of crystals. From a romantic suite for 2 to rooms for your wedding party and guests, it doesn’t get more luxurious and waterfront than Pan Pacific Vancouver. Add in sweeping views and signature amenities, and you may not want to leave! But when you and your guests do venture out, our central location makes it easy to enjoy seawall walks to Stanley Park, downtown shopping, and other urban adventures. In short, we’re passionate about food. From exceptional menus to customized catering, our Executive Chef and his team have earned a reputation for culinary excellence. Linens, lighting and audio-visual needs? We can take care of that too. In fact, we understand that it’s all about the details, and that’s where our wedding planning specialists come in. We’re here to assist with all the logistics and finishing touches, ensuring your event is seamless and extraordinary. Contact us and tell us about the vision for your dream wedding event?